Dr. Sam Kohn in his office with staff . 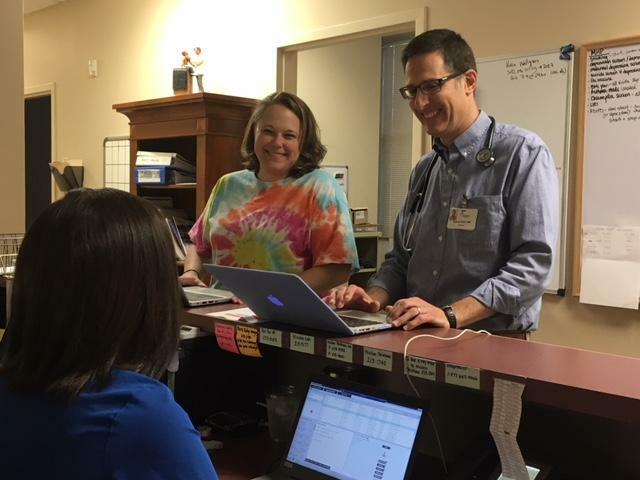 Host Frank Stasio speaks with WUNC data reporter Jason deBruyn and Blue Ridge Public Radio reporter Helen Chickering about their collaborative look into the numbers and the stories behind vaccination rates across the state. However, an increasing number of visits don't follow that routine, and more and more parents have started to ask questions. Some don't come to the doctor at all. "I'd say the trend is almost steady, where there's a larger proportion of people than I guess I would think for lots of different reasons are either skeptical of vaccines or not interested in vaccines," said Dr. Kohn. Across the state, parents have increased the use of this religious exemption. Statewide last school year, more than 5,500 kindergartners had not obtained the required immunizations within 30 calendar days of first attendance, according to N.C. Department of Health and Human Services data. That amounted to 4.6 percent of the total kindergarten population. Of those who had not received the proper vaccinations, just 120, or about 2 percent, reported a valid medical exemption. Even as the use of the medical exemption has decreased over the past half decade, the use of the religious exemption has increased. In the 2011-12 school year, 817 children filed for a religious exemption, about 0.7 percent of total kindergarten enrollment. By the 2017-18 school year, that increased to 1,450 kindergartners, or 1.2 percent of enrollment. 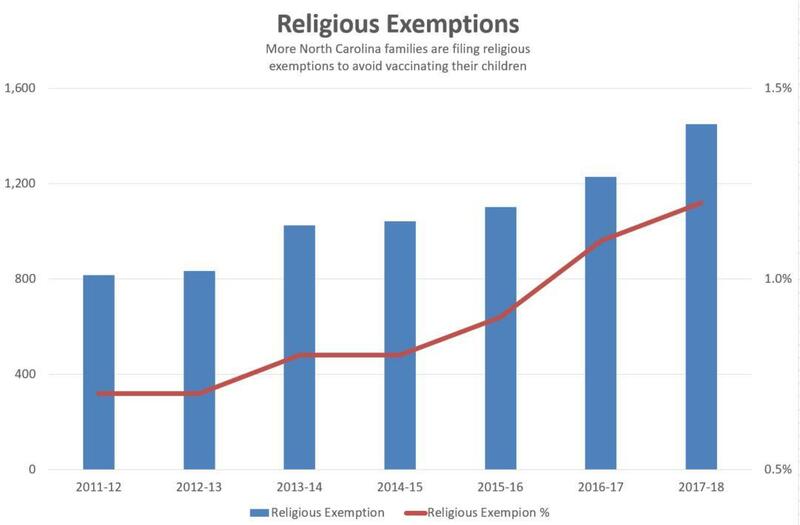 The rate of parents claiming a religious exemption to not vaccinate their children has increased across North Carolina. Dr. Anthony Moody is on the faculty in the Duke Health Department of Pediatrics and a member of the Duke Human Vaccine Institute. He said the trend "certainly is a concern," as it increases the risk that any of these highly contagious diseases could spread. Moody said that "we are kind of a victim of our own success" because medical professionals did such a good job encouraging families to vaccinate their children through the past half century. "Now people don't think about (these diseases) as being real threats," he said. For example, before pertussis vaccines became widely available in the 1940s, about 200,000 children in the United States contracted the disease each year, and about 9,000 died as a result of the infection, according to the Centers for Disease Control and Prevention. Furthermore, researchers at the UNC-Chapel Hill Eshelman School of Pharmacy say vaccines have saved 20 million lives and $350 billion in the world's poorest countries since 2001. Religious exemptions are clustered in the western counties, but by not means exclusively. Use this interactive chart to find any school in the state, or filter by type of school or county. Moody said he tries to explain to parents that they are not only putting their own children at risk, but other children and adults as well. Medical professionals will refer to the term "herd immunity" to mean that unvaccinated children can still be protected from diseases if they never come in contact with another person carrying the virus. But Moody points out that all of these diseases live somewhere in the world, and as international travel grows ever easier, it becomes only more likely that a child – even in remote areas of North Carolina – could come in contact with someone carrying the virus. Worldwide, about 20 million people contract measles every year, according to CDC, including in Europe, Asia, the Pacific Islands, and Africa. If one of these highly infectious diseases travels to North Carolina, it might not spread far if vaccination rates are high. But without that protection, it could spread quickly throughout a community, putting in danger the lives of those with medical reasons for not responding to vaccines, and others, like cancer patients receiving immune-suppressant drugs. "It's one thing to say that you are putting your own child at risk," said Moody. "But really what you are talking about is putting everyone at risk. And that's the message that we've got to put out." There is no accepted target for "herd immunity," and Moody said the figure would change depending on the virus. For instance, measles is one of the most highly contagious diseases in the world, so there is a high likelihood of it transferring to individuals without a vaccine. In those cases, even small numbers of unvaccinated children can pose a serious risk, said Moody. In North Carolina, the highest concentrations of parents choosing the religious exemption are in the mountain counties. For each of the past seven years, Buncombe County, which includes Asheville, has ranked in the top two of North Carolina counties with the highest rates of parents claiming a religious exemption. Last year, the county was No. 1 with 5.7 percent claiming the religious exemption, according to DHHS data. This interactive map shows the rates of religious exemptions by county as well as the rates claimed by county for the past half decade. In the drop down box between the graphics, choose a county to highlight. Data provided by NCDHHS. Those figures didn't surprise Lisa Jillani. She's the founder of People Advocating Vaccine Education, a Charlotte-based nonprofit that provides exemption and other information to parents across North Carolina and the only person out of the many non-vaccinating parents reached by Blue Ridge Public Radio and North Carolina Public Radio who agreed to an interview. "Now this is just the impression a lot of us get from Buncombe County, is there is a more naturally minded community there," Jillani said. "And they are going to be using natural methods to either prevent or manage disease as it happens." Jillani said parents are often worried about backlash from the medical community and other parents, so they choose keep their choice not to vaccinate quiet, sharing only with other like-minded parents. The numbers reflect that sentiment, according to Buncombe County Health and Human Services Director Dr. Jennifer Mullendore. "Parents that are like-minded tend to cluster together. That's what we're seeing locally," she said. "The non-medical exemptions tend to cluster in charter and private schools. We have schools where exemption rates are extremely high into the 20, 30 percent; even 60 percent range, which is scary for us, because if an infection got into that school, in that kindergarten, it potentially could spread like wildfire." While mountain counties have the highest rates of unvaccinated children on the aggregate, there are kindergartens throughout the state with elevated rates. At N.C Virtual Academy and North Carolina Connections Academy, both in Durham County, rates of religious exemption were 12.8 percent and 13.6 percent, respectively. At Emerson Waldorf School in Orange County 28 percent claimed the religious exemption. Wake County has six schools where the rate of religious exemption was in double digits; at Friendship Christian School it was 21.4 percent, the highest in the county. Finding a way to stop the fire that Mullendore referred to before it starts is the goal of the newly formed Immunization Coalition, a group that started in Buncombe, but is working to expand to other counties in western North Carolina. The group, made up of local public health officials, school nurses, doctors and the interested public gathered this summer for a brainstorming session. "There's the term people have used called antivaxxers, I try not to use that term," said Dr. Susan Mims, chief of pediatrics at Mission Children's Hospital in Asheville, and one of the organizers. She said creating a safe place for dialogue is an important first step. "That's going to help us get to a better place, rather than retreating to our corners and calling each other names and not dialoging, so I'm very hopeful that the initiative that we're creating in our community will be a center place for a health dialogue." At the state level, Health and Human Services tracks reports from individual schools. HHS did not make anyone available for an interview, but responded to questions via email. Leaders with the Department of Public Health said they were "aware of clusters of parents using a religious exemption in Buncombe County." According to a portion of the statement, an HHS spokeswoman wrote, "DPH’s Immunization Branch reviews the school report data annually and looks for trends in school reporting data that is summarized by county to determine low coverage areas. The branch monitors communities or geographic clusters with lower vaccination coverage levels and/or higher incidence of vaccine preventable diseases, works with local health departments to recommend steps to increase vaccination and prioritizes achievable activities that the best available evidence indicates will improve and sustain vaccination coverage levels in these areas." State leaders have encouraged parents to vaccinate their children. In a July press release, State Health Director and DHHS Chief Medical Officer Elizabeth Tilson said, "Vaccination is the best and safest way to protect your child from potentially life-threatening diseases including meningitis and cancers caused by human papillomavirus, also known as HPV. Vaccinations also help prevent the spread of diseases in student populations." Buncombe County in western North Carolina has now reported 11 cases of whooping cough, or pertussis. The Buncombe County Health and Human Services Department had reported four lab-confirmed cases earlier this week. Researchers at the UNC-Chapel Hill Eshelman School of Pharmacy say vaccines have saved 20 million lives and $350 billion in the world's poorest countries since 2001.